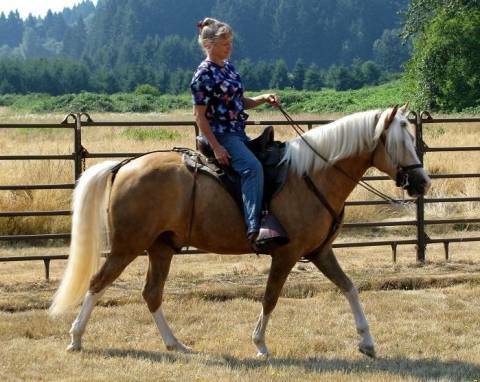 Nicely marked gelding, strong built, animated gait and canter, and a gorgeous buckskin!
" 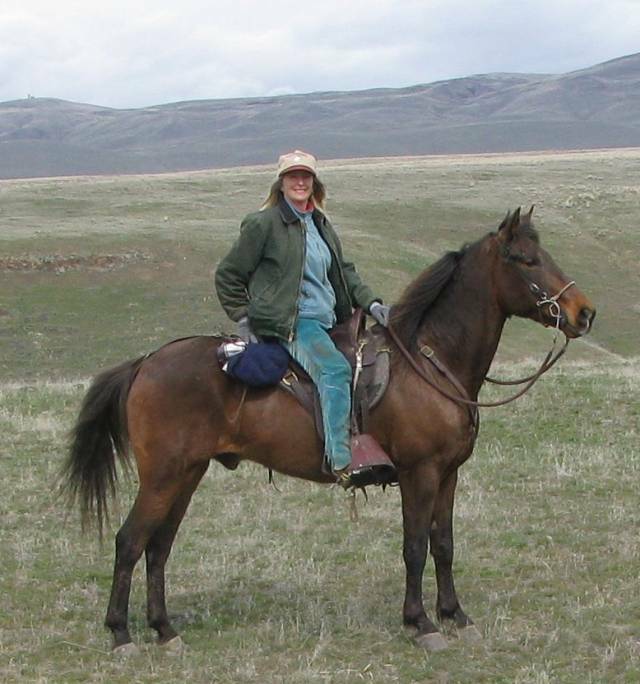 Grand Touch of Silver "
Tekoa Mountain Goldwalker - "Punky-Face"
Congratulations to: Martha Guenther of St. Maries, Idaho! "His name says it all ..... he is one smooooooth Walker"
Iron Man's Gray Shadow II - " CASEY "
Congratulations to: Louise Hill of Boring, Oregon! 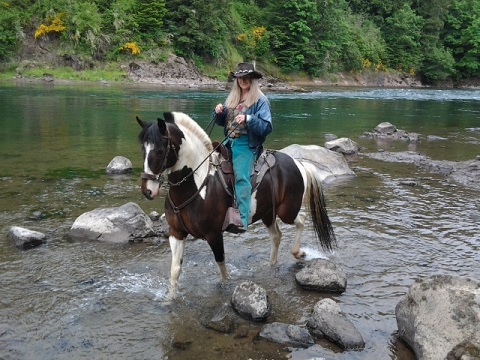 Moonstar's Montana - " Dusty "
Handsome Jack Jordan - " BROWNIE "
Congratulations to: Erin Mauck of Sandy, Oregon ! 14.2 hands of pure fun and all day stamina! 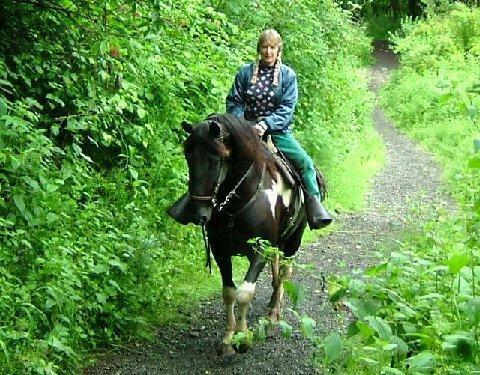 This fine horse is extremely well gaited with a nice canter and great attitude.
" 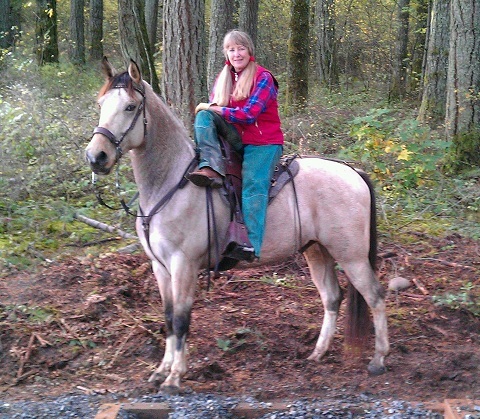 Tekoa Mountain Traveler "
It was nice to hear your news. I hope that you and Eric had a pleasant ride this afternoon. 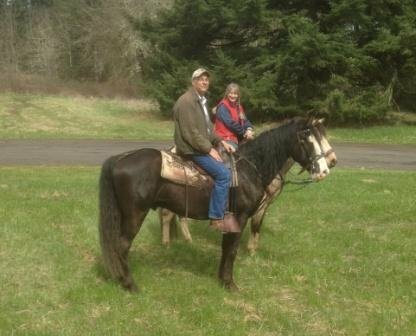 Dad came by today and we went out to see the horses. Dad rubbed Traveler above his tail, Jeff massaged his back and I scratched his neck under his mane-all at the same time. Traveler stretched out his top lip in pleasure. He was loving all the attention! We really adore him Mardelle. 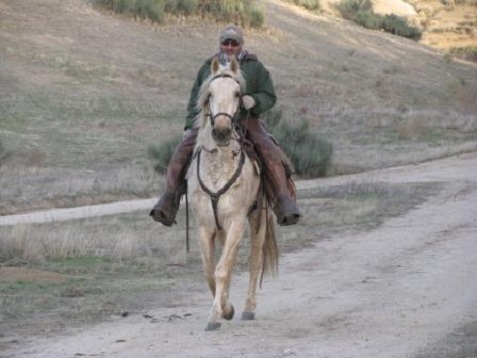 Traveler is the incredible horse he is, much in part, because of you. In someone else's hands he could have been a completely different horse. 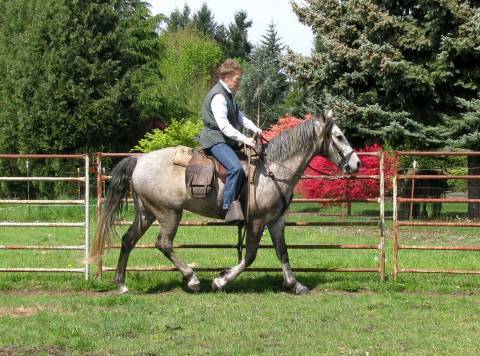 Individuals who start youngsters and begin their training play such a pivotal and key role in who that horse becomes. And with their body language, horses tell the new owner exactly what was done. I am so grateful that it was you who started and worked with Traveler. What a great gift you are giving to every horse that goes through your program, and to each one of us fortunate enough to have one of your horses. Thank you Mardelle. Your hard work is appreciated more than words can say. I haven't emailed you in quite a while so I thought I'd give you an update on Traveler. He has settled in really well and is definitely part of the family. Everything you said about him was so accurate and I couldn't love him more. Traveler was the horse of my dreams when I was a little girl. The beautiful Palomino with the baby doll head and those dark soft eyes, the 4 white stockings and blaze-the long flowing mane and tail. 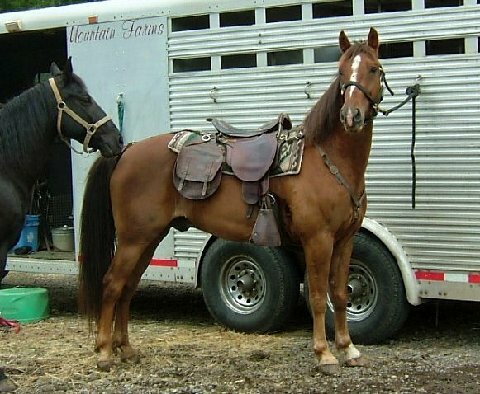 The horse that would let you wrap your arms around his neck and nuzzle you softly. The one who adored being brushed and braided, rubbed and primped and absolutely content to be in your company. Traveler is a dream come true for me. I've had many horses over the years that I've loved and adored, but there is a bond I have with Traveler that only YOU could understand. He is so incredibly smart and I notice all the little things he does that an outsider probably would overlook. You know, I have to cross our arena to get to the barn. When I go down in the evening to feed and clean, Traveler will whinny for me and come to the stall window to watch me walk down. After cleaning and feeding he will actually leave his hay to come back to the window to watch me walk back up to the house as I say goodnight and wave to him. We can't be outside or working in the yard without going down to the barn because he will call to us until we acknowledge him. If we work on something in his stall or turnout, it doesn't matter if he's eating or whatever, he will stop what he's doing to examine our handy work. He is so curious about everything! 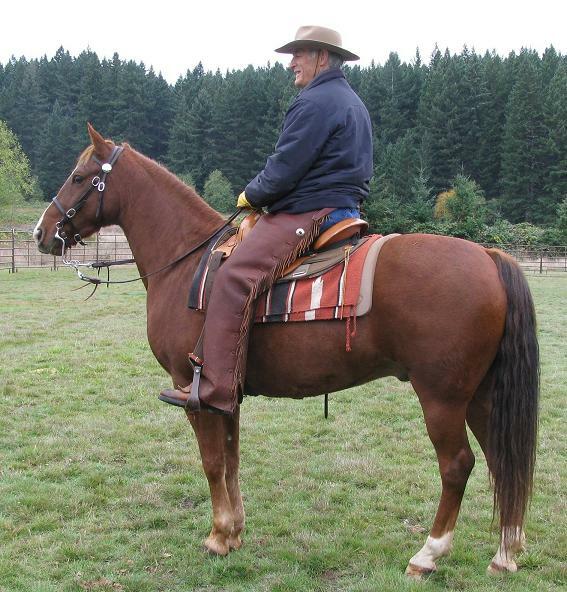 I've been trying out a couple of saddles- a Don West Gaited saddle and a Tennessean made by Crates. I've been on Traveler just walking, taking it easy and he's been such a sweet boy! His treat after a bath is to go up on the lawn and graze while he dries off. At first, after his bath he wanted to immediately roll, but he has since realized that walking across the arena to eat some grass is a lot more fun! To protect him from flies, midges mosquitoes and rubbing of mane and tail he wears a Kensington sheet, neck cover and mask. He sort of looks like a space alien but he itches less. So far so good! I know it was difficult for you to let go of him Mardelle, but I want you to know Traveler has a good home with us and my family and I love him dearly. Hope you and Eric are doing well Mardelle. Drop me a line when you have a chance. Tekoa Mountain Highlife - " Jasper "
Congratulations to: Tom Maechtle of Sheridan, Wyoming!